Thomas Stirling was born in 1733 into a family that held the baronetcy of Ardoch, a place near Perth in the Scottish highlands. Thomas was the second son and received his first commission in October 1747, shortly after his 14th birthday, from the Prince of Orange as ensign in the 1st Battalion of General Marjoribanks' Regiment, which was with the Scots Brigade in Dutch service. Ten years later he raised a company for the 42nd Foot, which was mustering to head off to the Americas, and was promoted captain. He stayed with the regiment until the end of the AWI. He saw action in the F&IW, in Canada and the Caribbean, taking part in the capture of Havana in 1762. In August 1765 Stirling and his company travelled from Fort Pitt in western Pennsylvania to the Illinois country to accept the transfer of Fort DeChartes, situated on the east bank of the Mississippi River, from the French. Several months Stirling and his men were relieved and they sailed down the Mississippi to New Orleans and Pensacola. They arrived back in New York in June 1766 after a trip of over 3000 miles. The following year Stirling and the 42nd transferred to Ireland for garrison duty, where they remained until the commencement of the AWI. Stirling became the lieutenant-colonel of the regiment in 1771. The Black Watch returned to America in 1776, having spent time raising fresh recruits in Scotland after news of the rebellion reached Britain. Stirling appears to have been at pains to train his regiment in frontier-style fighting. The regiment fought in the New York campaigns of 1776 and 1777. Stirling and his men performed notably in the attack on Fort Washington in November 1776 - General Howe wrote in his General Orders that he "is extremely sensible of the Universal Spirit and Alacrity which evidently animated all the Troops that were Yesterday engaged, and desires his particular thanks may be given ... To Lieut.-Col. Sterling, and the 42d. Regiment...". In June 1777 Stirling, like other senior officers, began receiving brigade commands, initially comprising the 33nd Foot and the two battalions of the Black Watch. In February 1779 he commanded troops from those regiments and the light companies of the Guards in a raid on Elizabethtown, New Jersey. This time Stirling received plaudits from the American side - the New Jersey Journal stated that "Colonel Stirling who commanded the detachment shewed himself throughout the whole expedition not only the officer, but the well bred gentlemen..."
On 1 May 1779 Stirling was appointed to an honorary position, as Aide-de-Camp to the King. In June he was breveted to the rank of brigadier general and he was given what was nicknamed the "Royal Brigade", of the 7th Foot (the Royal Fusiliers), the 23rd Foot (the Royal Welsh Fusiliers) and the 42nd (the Royal Highlanders). However, this brigade was sadly short-lived and the other regiments were soon replaced with the 63rd and 64th. In 1780 Stirling was badly wounded by a musket ball in the leg in a skirmish near the Connecticut Farms during Knyphausen's attack on New Jersey. Surgeons did not expect him to survive; he did, but his days on active service days were over. Letters to his relatives show that his recovery was slow and painful, but he successfully managed to prevent amputation of his leg. Despite his wound, he continued to progress up the ranks. He became colonel of the 71st Foot in 1782 and later that year was promoted to major-general. In 1790 he became colonel of the 41st Foot. Promotion to lieutenant-general came in May 1796 and finally to full general in 1801. In 1799 he succeeded his elder brother as baronet of Ardoch, but Thomas was unmarried and childless and so the baronetcy came to end when he died in 1808. This is the second of the King's Mountain Miniatures Highland officers I painted last year, following on from the 71st Foot's James Baird. 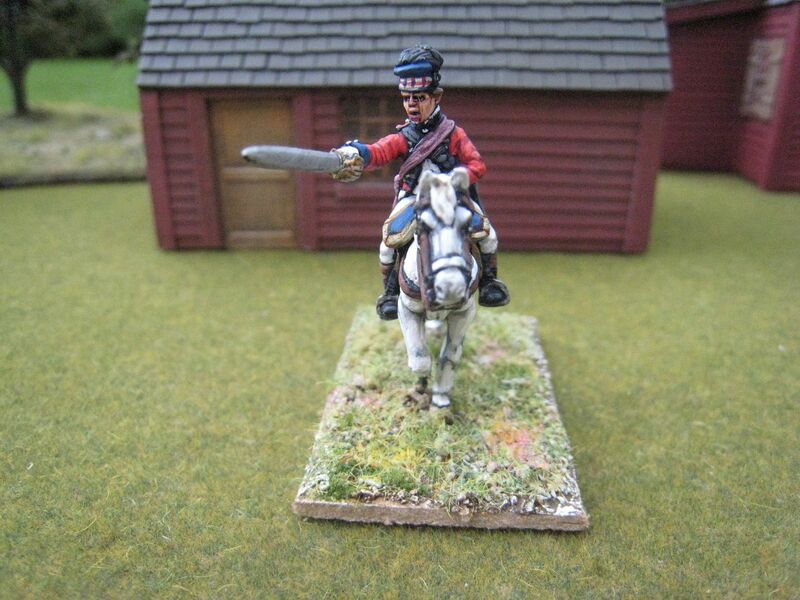 Stirling appears as a brigade commander in the Harlem Heights scenario in the 3rd Caliver/"British Grenadier" scenario book. As I noted with the Baird figure, the right arm is separate so you can position it how you like and this pose is different to Baird's. I probably should have given Stirling powdered hair; but to be honest, I hadn't decided who this figure was going to be when I painted it! But it's good that finally, after over 10 years, my 42nd Foot finally have their commander. 1 figure. Painted April 2016. 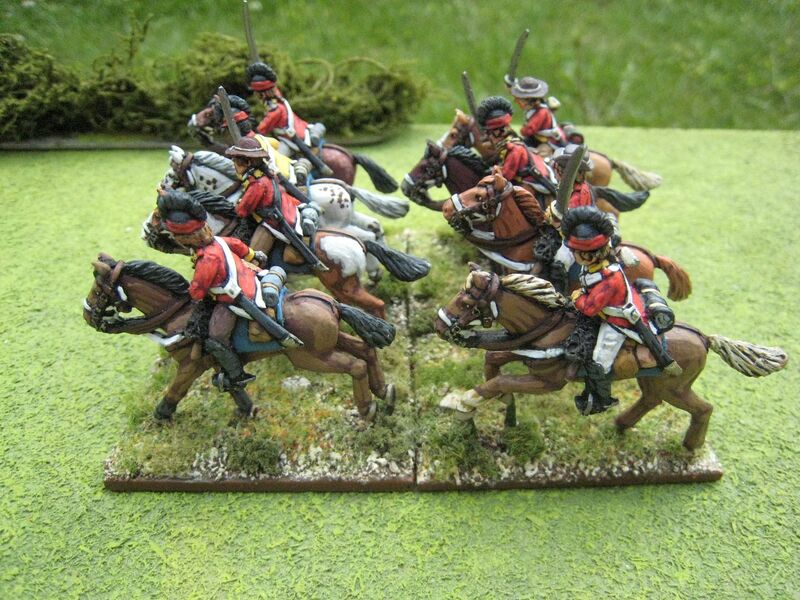 Many Loyalist units were raised in the South and these figures represent generic Loyalist cavalry. I like to give my units specific regimental designations, so I'm calling this one the South Carolina Dragoons, even though it's designed to cover a variety of units. Finding specific information on these sorts of units is difficult. The Royal Provincial website lists 3 units of "South Carolina Light Dragoons" but provides no details. The site also refers to a unit of "North Carolina Independent Dragoons". 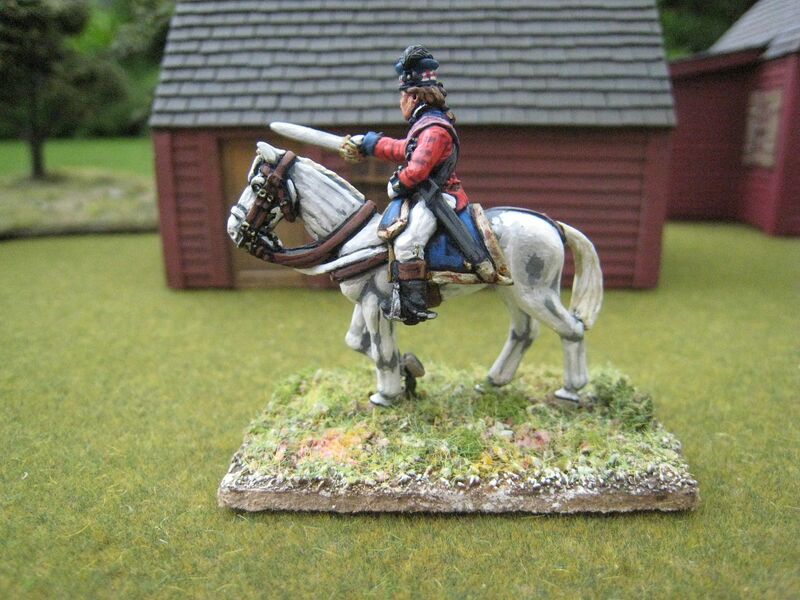 These units seem to have be raised in 1781 and operated either as scouts or mounted infantry. We do know that at least some of the South Carolina Loyalist cavalry was commanded by Major John Coffin, formerly of the Loyalist infantry regiment the New York Volunteers. I wanted something for use in two "British Grenadier!" scenarios: the "South Carolina Dragoons" at Eutaw Springs (8 figures) and the "New York Dragoons" at Hobkirk's Hill (6 figures). It's possible that these two units are in fact the same, as there is speculation that whilst the "New York Dragoons" are recorded as having been at Hobkirk's Hill this unit may have been confused with the infantry New York Volunteers and that the cavalry present were from South Carolina. 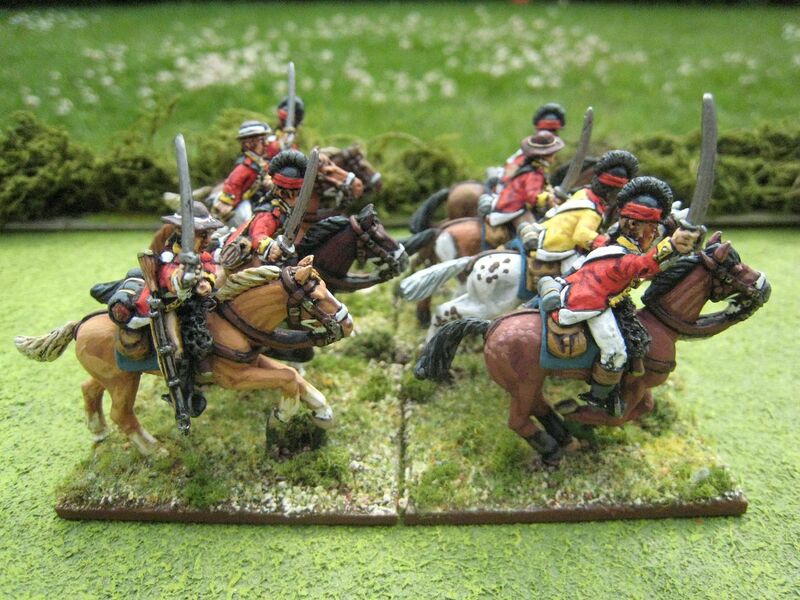 I thought that if dressed in proper cavalry uniforms the troopers might have sought to emulate British regiments like the 16th and 17th Light Dragoons. So tarleton helmets seemed appropriate, although chum Brendan Morrissey suggested to me that floppy hats would probably have been worn as well as, or instead of, metal helmets. 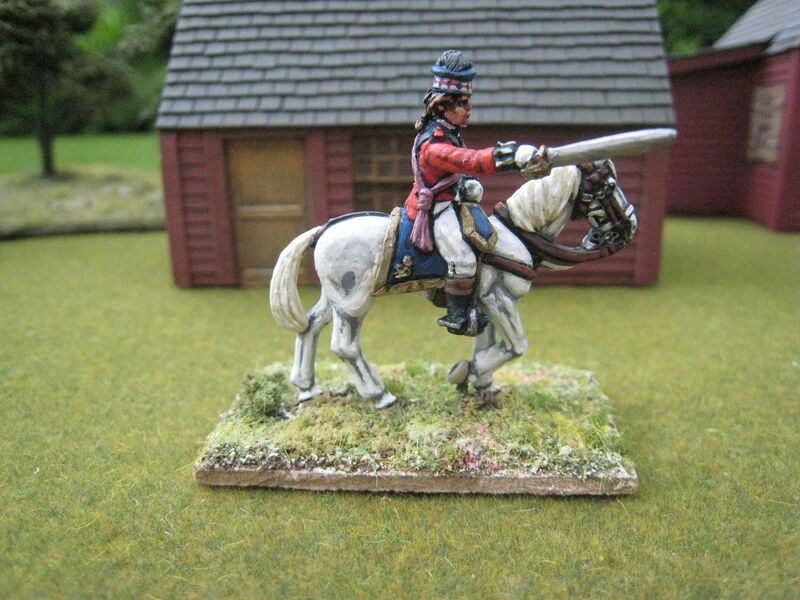 I decided to use more Eureka "ragged Continental" figures (which I've used for other Loyalist cavalry units, the East Florida Rangers and Emmerich's Chasseurs). Options for facings colours included blue, which would have been suitable for a New York unit, and yellow, which was more suggestive of South Carolina as it's known that some of the infantry Loyalists had yellow facings. 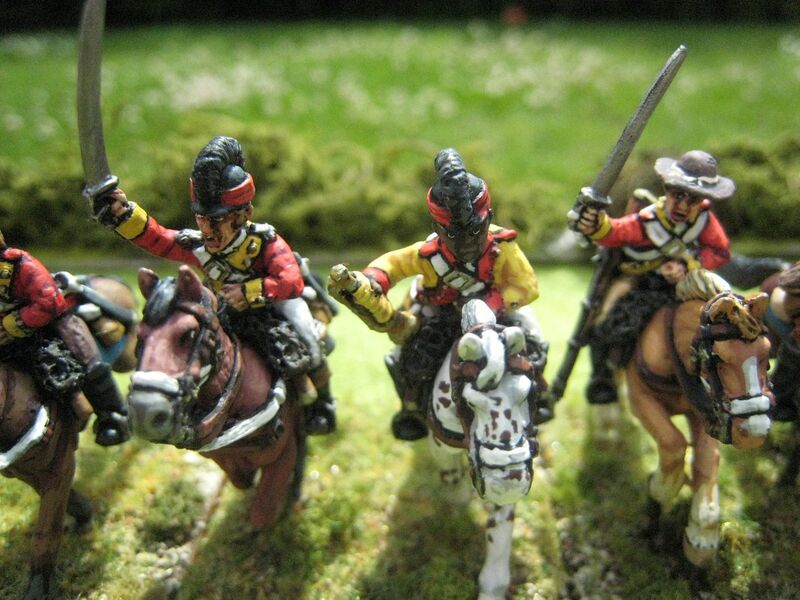 Given that I have the blue-faced 16th Light Dragoons in a similar uniform, I decided to go with yellow. 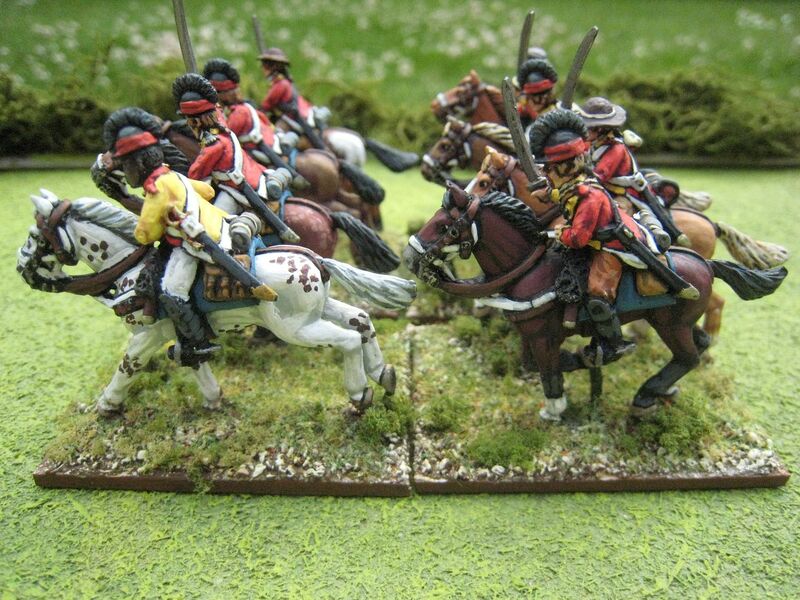 I'm almost there with British and Loyalist cavalry now - just the 17th Light Dragoons in their northern theatre dress and the British Legion left to do. 8 figures. Painted April-May 2017. This unit was raised in June 1776 in Virginia, and was originally on the state's establishment as the Virginia Light Horse Regiment. In November is was taken into the Continental Army and re-designated as the 1st Continental Light Dragoons on 25 November 1776. One of the original troops commanders was Captain Henry Lee, who in 1778 was promoted to Major and authorised to raise his own legion of infantry and cavalry. The regiment was present at Brandywine, Germantown and Guilford Court Horse. 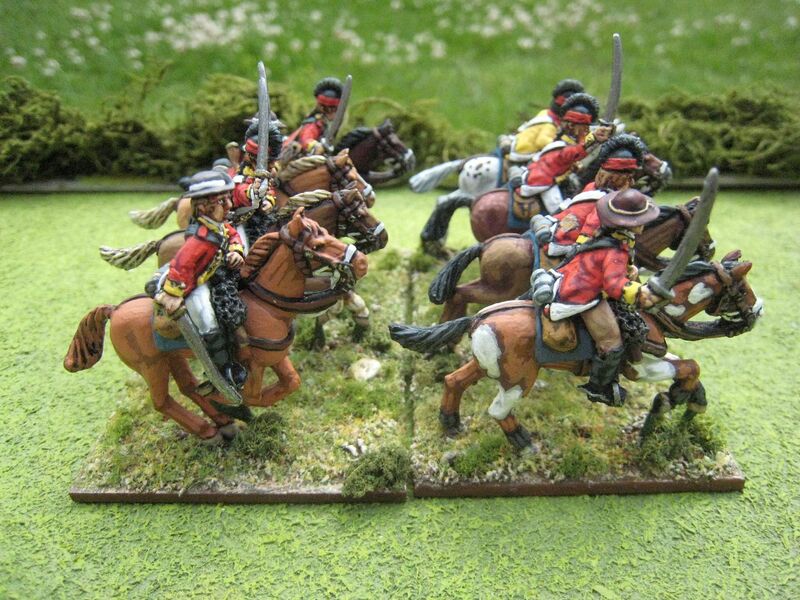 In January 1781 the 1st Dragoons were re-organised into a legion, with four mounted and two dismounted troops, and was re-named the 1st Legionary Corps. The regiment was disbanded in November 1783. 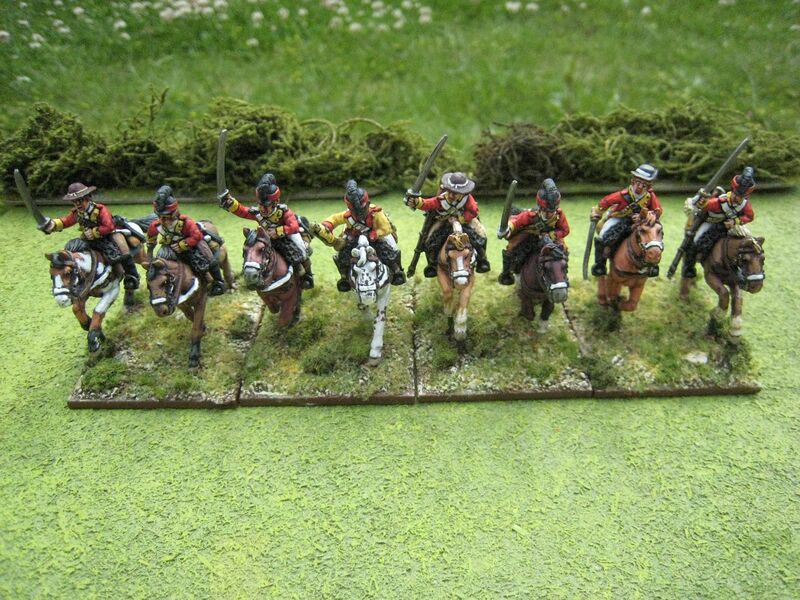 The 1st Light Dragoons are commonly portrayed in brown faced green coats and leather caps. I had two Foundry dragoon figures left over and I decided to use them for an alternative interpretation of the unit's uniform to that which is commonly portrayed (e.g. by in the Perry and Fife & Drum ranges). This different uniform of blue faced green coats and the standard brass helmet is shown in a Don Troiani painting, with the caption "Fall-Winter 1780-1781". I've seen other references to this uniform in descriptions of Greene's army at Cowpens. Maybe this is a new uniform issued at the time of the re-designation into the 1st Legionary Corps. In the published "British Grenadier!" orbats, the 1st Dragoons appear at Cowpens (4 figures), Weitzel's Mill (2) and Eutaw Springs (2). Given that Cowpens was fought in January 1781, Weitzel's Mill in March and Eutaw in September, I thought I could justify using these figures. Other references refer to the post-1781 uniform coats as being blue faced red, but given that I already have figures in that uniform I decided to go with Troiani and have green facings. With a unit of only 2 figures I don't have enough for Cowpens, so at some stage I will paint 4 in the earlier uniform of brown faced green coats. 2 figures. Painted May 2017.